Land disputes are considered both key sources and perpetuating factors of conflict in the eastern Democratic Republic of the Congo (DRC). Over the years, scholars and practitioners have identified a number of critical land-related factors contributing to violence and conflict. These include a considerable diversity of forms of land governance that are fostered by: the existence of overlapping legal frameworks and weaknesses in statutory land law; increased competition over land, including among elites and between autochthonous and migrant communities, sometimes resulting from large-scale displacement; and the poor performance of the administration and justice system in the settlement of land disputes. 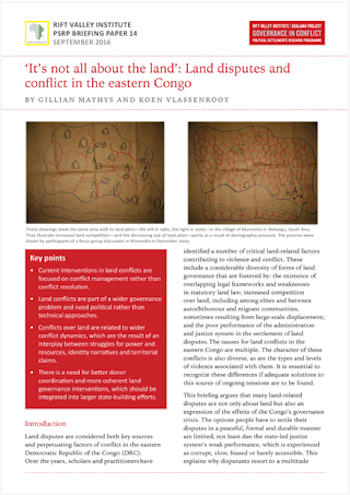 This briefing argues that many land-related disputes are not only about land but also an expression of the effects of the Congo’s governance crisis. The options people have to settle their disputes in a peaceful, formal and durable manner are limited, not least due the state-led justice system’s weak performance, which is experienced as corrupt, slow, biased or barely accessible. This explains why disputants resort to a multitude ￼￼￼ ￼￼￼of alternative conflict resolution, mediation and arbitration mechanisms, involving a wide range of state and non-state actors and structures, some of which have been introduced with the support of external actors.